Whether you're pregnant like me or just want something salty sweet to enjoy during the big game, this dip is the answer to all of your cravings. Inspired by 7 Layer Mexican Dip, this sweet take is loaded with salty potato chips, creamy peanut butter, chocolate and more! Enjoy with animal crackers, pretzels or a spoon! Scroll down for the recipe below and follow me on instagram @BrandiMilloy for more food inspiration & recipes! 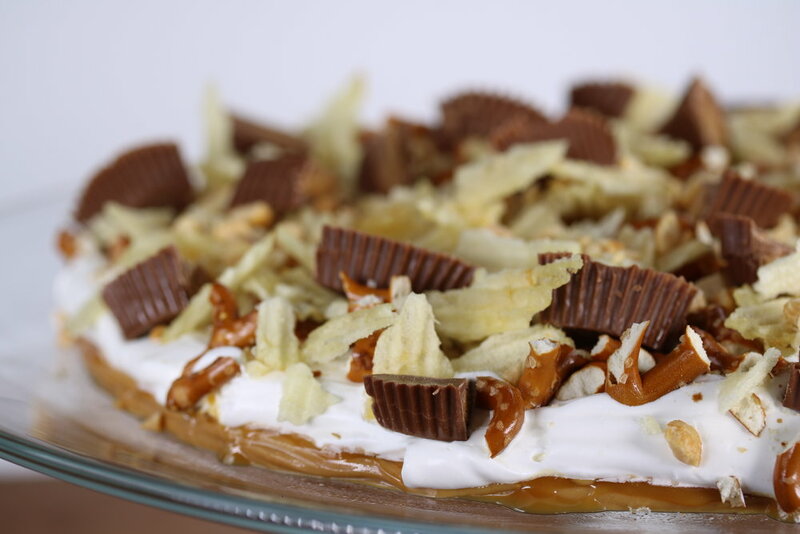 Onto a serving plate or pie dish, layer peanut butter, caramel sauce, whipped topping, pretzels, potato chips, peanuts and chocolate candies. Serve immediately with crackers, animal crackers, pretzels and cookies.